Yesterday’s Tour of California stage featured top-notch cyclocrossers in a long break that made it within 10 kilometers of the finish before being caught by the pack. Former Cyclocross World Champion Lars Boom (Rabobank) and Jeremy Powers (Jelly Belly), the U.S. top-ranked CX racer, were joined by Canadian Rob Britton (Bissell), who has toed the line at many CX events. 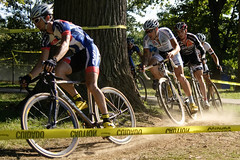 Midway through the stage, a three-man chase group featured Davide Frattini (Team Type 1), the winner of the 2009 Charm City Cyclocross. Before the stage started, Powers commented on his Twitter feed that Boom was putting everybody to shame in the cyclocross classification. Of course, having somebody with the palmarès of Boom near the top of the general classification made it easy to overlook another cyclocross phenom that was putting it to everybody including Boom. Namely, Peter Sagan, the Slovakian rider who is currently in fourth place and winning the Young Rider Classification. Sagan is the 2008 World Junior Cyclocross silver medalist. If you saw the Tour of California highlights from stage 3, you may remember Sagan showing off his smooth CX skills after going down on the climb and performing a flawless running remount to stay with the front group. The involvement of the CX boys in the break produced a lot of chatter on the interwebs. We here at CXHairs even attempted a little live Twitter coverage (@CXHairs) of the ATOC CX Classification during yesterday’s stage. In that vein, we are proud to present the first CX Classification Jersey in a Road Stage Race Competition. Before unveiling today’s ranking, there are a couple matters that need clarification. Namely, Horner and Armstrong. Both raced CX last year. Armstrong did Cross Vegas and Horner did a handful of races. Does this qualify them for the CX Jersey? Let us know what you think. For now, they will not appear on the list. Also, let us know if there are any ‘crossers racing in California that have been left off the list. The standings as of now are based on GC time. Also included is the Points race totals, but for the official tally it is probably best to stick with GC.